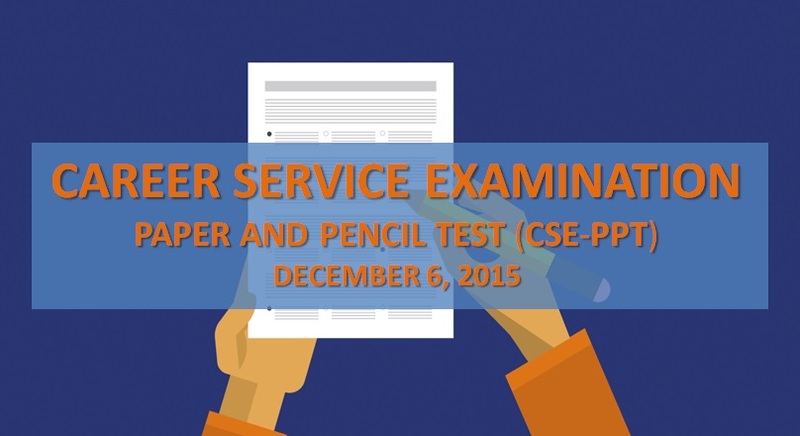 MANILA, Philippines - The Civil Service Commission (CSC) announced the new schedule of Career Service Examination Paper-and-Pencil Test (CSE-PPT) for Professional and Sub-Professional levels that was postponed due to Typhoon Lando. CSC through Examination Advisory No. 15, s. 2015 said that reset is on Sunday, December 6, 2015 to be conducted in select regions and testing centers in the country. The rescheduling is in light of the suspension of CSE-PPT on Oct. 18 in the National Capital Region (NCR), Regions 1 (Ilocos), 2 (Cagayan), and the Cordillera Administrative Region (CAR), and in the Cabanatuan City and Olongapo City testing centers due to the onslaught of Typhoon Lando. The Oct. 18 CSE-PPT was also suspended in the Bongao, Tawi-Tawi testing center due to flight cancellation, impeding the transport of test materials. Affected examinees of regions and testing centers mentioned above shall have the same school assignments as in the suspended Oct. 18 examination. As such, they are no longer required to register for the examination. The CSC stressed, though, that any request for transfer of testing venue shall not be allowed. On the other hand, though no suspension was implemented in Regions 4 (Southern Luzon) and 5 (Bicol), as well as in City of San Fernando, Pampanga and Malolos City testing centers, the CSC also considers those who were not able to take the Oct. 18 examination in these areas as “affected examinees”. They need, however, to register for the Dec. 6 examination. Registration period runs from Oct. 26, 2015 until Nov. 6, 2015 only. To register, examinees of Regions 4 and 5, and of the City of San Fernando, Pampanga and Malolos City, should appear in person before the CSC Regional or Field Office nearest them and present their valid I.D. and, if available, their original Application Receipt and/or CSC Official Receipt for the Oct. 18 examination. Consequently, examinees in these areas may have different school assignment from that assigned to them for the Oct. 18 examination. They could check their school assignment for the Dec. 6 examination through the ONSA or Online Notice of School Assignment in the CSC website one week before examination. They could also inquire with the CSC Regional Office concerned. The CSC reminds all examinees concerned that they are given one chance only to take the rescheduled examination free of charge. “Those who would not be able to take the Dec. 6, 2015 examination shall have their examination fee and slot forfeited,” the CSC said, stressing that any request for postponement or another rescheduling shall not be allowed. The CSC further clarified that the directive for the Dec. 6, 2015 examination does not cover Regions 6, 7, 8, 9, 10, 11, 12, Caraga and ARMM, except for Bongao, Tawi-Tawi. This means that examinees of these regions who were not able to take the CSE-PPT on Oct. 18 had already forfeited their examination slot and fee.